Enjoying the Gift of Life ! They may be some of the word's one might think of when seeing this beautiful bird on a nature walk. 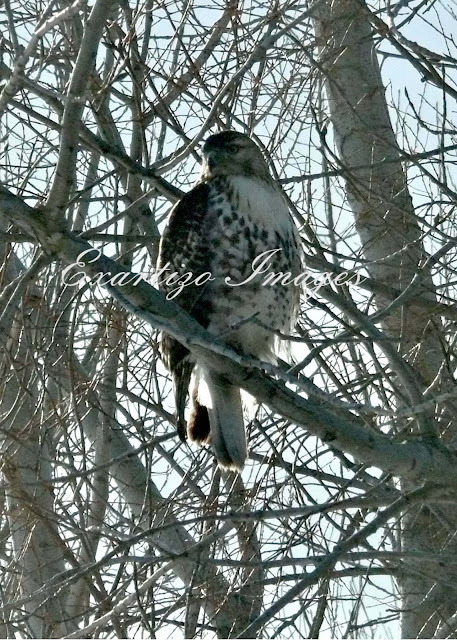 This stunning bird is a red tailed hawk, common here in North America. But... as common as it is, to see a red tailed hawk soaring over fields or sitting quietly; most folks would stop and enjoy this gift of life. My husband had spotted this splendid creature while driving down a road. I'm sure Mr. hawk was waiting patiently for a mouse or rabbit at the time. Now he seems to be looking directly at my husband while he snaps off a few pictures. WATCHING.... would be a word to describe what this beautiful creature is doing. We as the human race should take our cue from this guy. Watch...keep your eye open for opportunity... but don't let it consume you. Watch...be aware of danger...but don't let it overcome you.